The crash that saved my life! Paul Simmons had a collection of photographs from his Grandfather’s (Arthur George Simmons) time in the fledgling British Air Force during the First World War. Paul was keen to find a new permanent home for this collection. After considering donating the collection to the IWM or The National Archive or even selling it at auction Paul’s family did a little online searching to try and find a more suitable long term home for the collection. After searching they discovered one of our articles about the WWI airbase and flying school at East Boldre, then called RAF Beaulieu where Arthur was stationed and training. 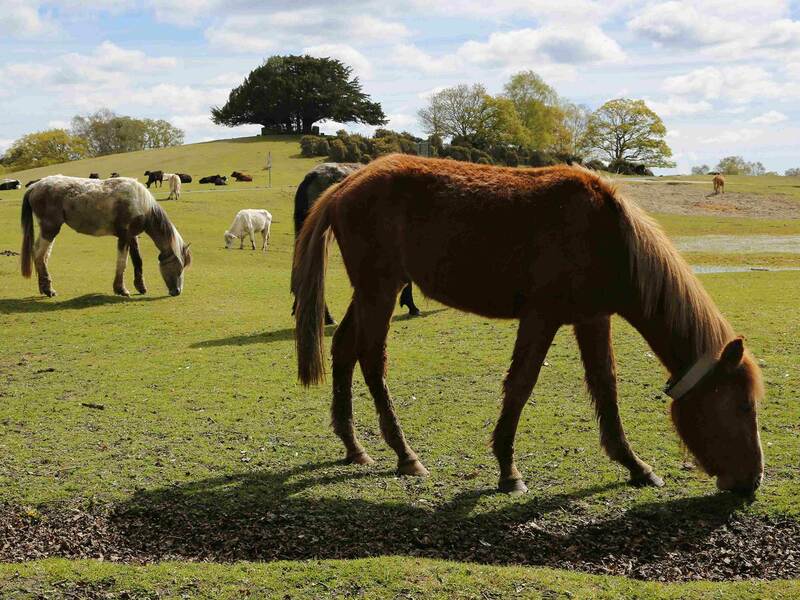 Paul got in touch with the New Forest Remembers team to talk about donating the collection. On receiving Paul’s very kind offer the NFR team got in touch with the New Forest Heritage Centre as it was felt that they would be the best long term home for this wonderful collection. Arthur George Simmons was born in 1898, aged 19 ‘Simmons A. (4975)’ joined the Royal Flying Corps (RFC) in 1917. He was soon posted to RFC (later RAF) Beaulieu, a Training Airfield, at East Boldre, Hampshire. During the first six months of 1918 the flying training for the British pilots at RAF Beaulieu was carried out by three training squadrons, No. 1, 73 and later 29. The majority of the initial training was conducted using Avro 504 aircraft, with pilots then progressing to fly the more advanced Sopwith Camel fighter. The airspace over East Boldre would have been busy as the American 93rd Aero squadron was also being trained by the RAF at Beaulieu during early 1918. On 1 April 1918 the Royal Flying Corps (RFC) and the Royal Naval Air Service (RNAS) amalgamated to form a new service the Royal Air Force (RAF). The Arthur Simmons collection comprises of two photograph album, loose paperwork (relating to his training), his book ‘Technical Notes – Royal Flying Corps’, his Aviator’s Certificate and his two medals. The two photo albums date from 1917 to around 1920 and hold some personal family photos as well as images for such places as East Boldre (RAF Beaulieu) airfield, Lymington, the No.1 New Zealand Hospital in Brockenhurst, the aerodrome at West Blatchington and a number of crashed aircraft to name just a few. 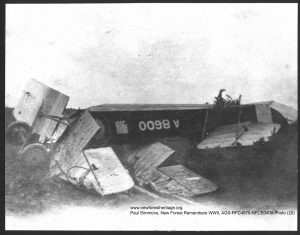 Arthur Simmons’ crashed Avro 504 (A8600) bi-plane at RAF Beaulieu (East Boldre). 13 April 1918. The report from the official enquiry of Arthur’s last crash. Avro 504A, A8600, 13.04.18, Stalled on turn and spun. A/Sgt: A.G. Simmons inj. Court of Enquiry 22/03/1918 A/SGT: A.G. Simmons. The court, having viewed the wreckage and examined the evidence, are of the opinion the Sgt. Simmons the pilot of Avro N0.8600. lost flying speed whilst turning to the left & that owing to lack of height, he was unable to extricate his machine from the resultant spin. Avro 504A was the first modified variant of the Avro 504 with smaller ailerons and broader struts and a Gnome Monosoupape 7 Type A seven-cylinder rotary engine offering 80 hp (60 kW) of power. More photographs from this collection will be added over the coming weeks.